Recently I was challenged by the lovely folk at Debenhams to style up some pieces from their Christmas partywear range. Not only did I have to pull a look together that would be perfect for the dance floor, but I also had to work with the items to create an outfit that would look just as good during the daytime. Working in an office environment means I’m always on the hunt for versatile work-appropriate pieces that I can wear for other occasions too, so this challenge was definitely something I was up for! 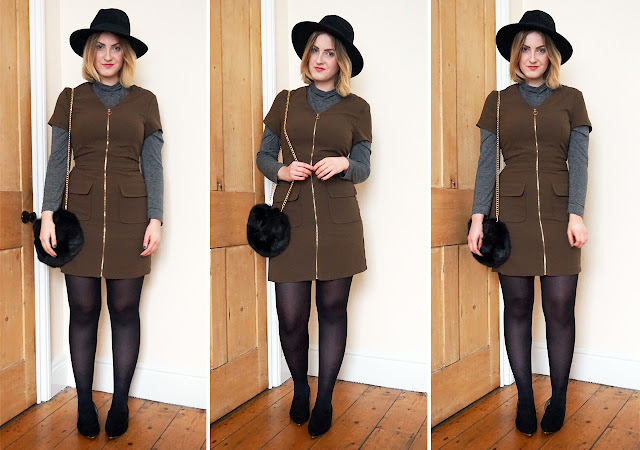 Right now I’m a sucker for simple pieces in neutral colours, so I thought picking a dress in a shade such as khaki would be a big tick for versatility, as it works well with many other colours in my wardrobe. I went for a gorgeous figure hugging zip front dress that could suit the office with some clever layering, or a party with some killer heels. Speaking of heels, I chose a stunning fringed pair from the new Nine by Savannah Miller collection that are super pretty yet suit the structured style of the dress. Finally, to pull everything together I decided to go for an adorable faux fur clutch complete with gold strap to match the gold hardware of the dress. For the day look, I decided to layer the dress over a simple long sleeved roll neck t-shirt, and throw on a pair of black tights with my new favourite pointed pumps. This look would be great for the office, or even just a day out shopping or for lunch with friends. I wore it with one of my trusty fedoras and finished the outfit off with the super-cute faux fur bag! For the evening look I wanted to keep things simple, to let the dress and accessories take centre stage. I decided to add a slim fit black blazer to the look to match the (amazing) shoes and of course the clutch bag. For a finishing touch I added a pop of colour in the form of a bold red lip for a nod to Christmas! 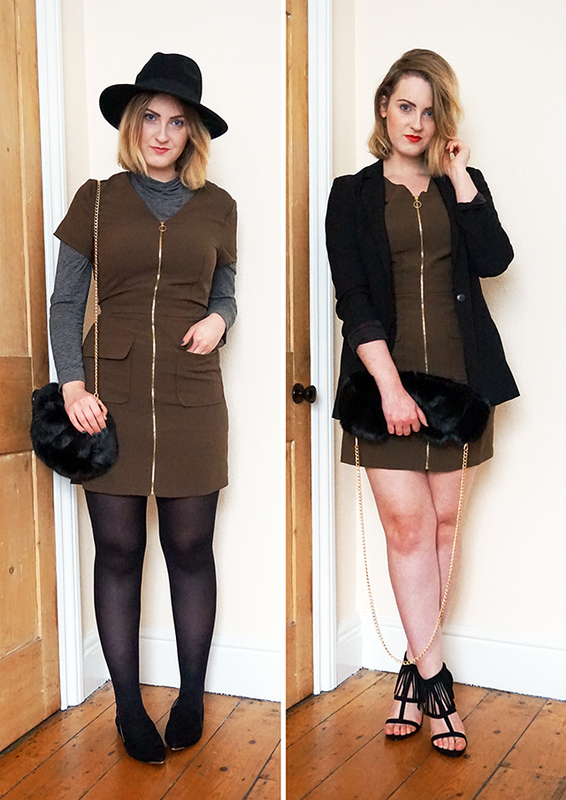 I love how both of the looks turned out, and will definitely be wearing the dress in many outfit combos for work and play! How would you style my dress from day to night? What’s your perfect outfit combination to take you from work to party? Love that dress, so versatile! I'd never thought of layering it with a tee, looks great!